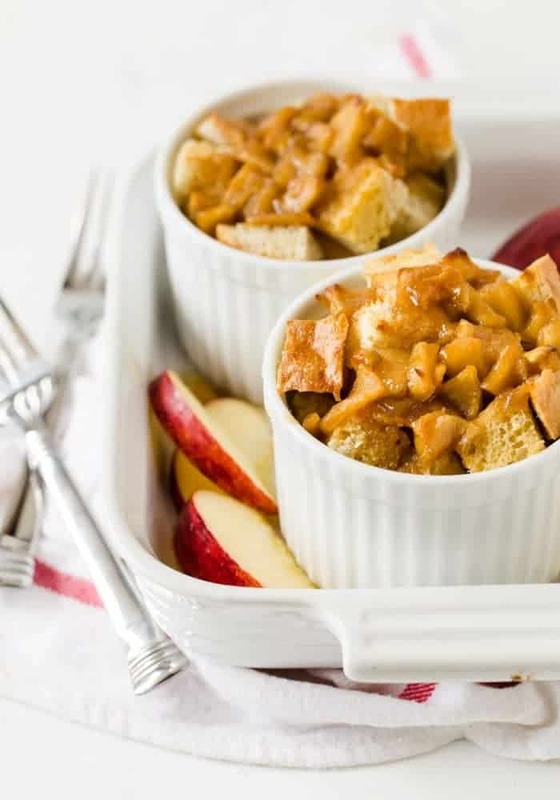 Making French Toast for a group just got easy with these Easy Caramel Apple French Toast Cups! French toast doesn’t get the love it deserves. I’ll whip up a batch of pancakes without a second thought, but French toast seems like so much more work. That is, until I made these Easy Caramel Apple French Toast Cups. French toast is one of my favorite sweet treats for breakfast, but I’m not a fan of standing at the stove waiting so everyone can eat. These Easy Caramel Apple French Toast Cups with layers of bread and caramel apples give you the French toast taste you crave without all of the work. And better yet. It’s baked in the oven and can be on the table in 30 minutes. No need to have breakfast prepped ahead of time for these gems. We used our favorite Kerrygold® Salted Butter to sauté the apples as the rich grass-fed butter flavor is the perfect complement to the tart apples. Swirl in some brown sugar to help caramelize the apples, and your french toast just got an major upgrade. 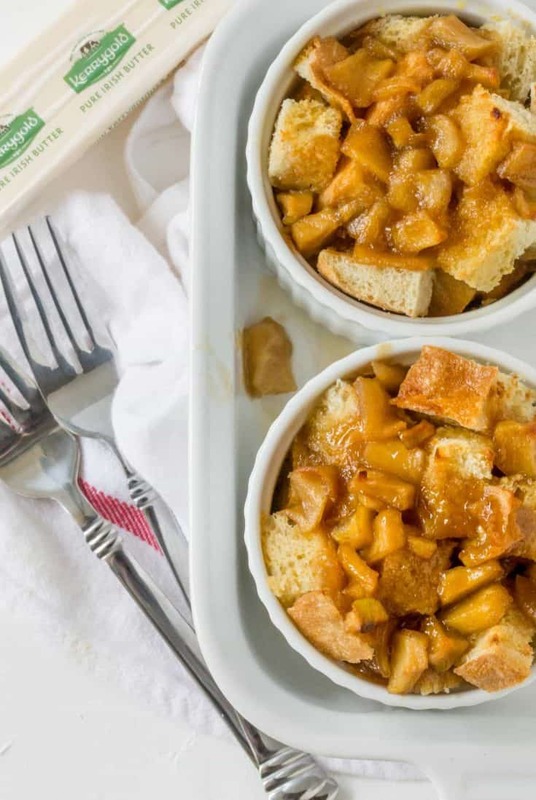 With the layers of caramel apples mixed in with the french toast cubes, not only is it easy to make a large batch for a group, you don’t even need maple syrup to eat these Easy Caramel Apple French Toast Cups. Although if you do, there’s no judgement here. Preheat oven to 350. Spray ramekins with cooking spray and set aside. In a small skillet, cook apples and butter until apples are slightly soft about 5 minutes. Add flour and cook for 30 seconds, stirring continuously. Add brown sugar and water and cook for additional 2 minutes stirring until combined. Remove from heat and set aside. Place eggs in a medium bowl and beat well. Add milk and half and half and whisk to combine. Stir in vanilla and cinnamon. Place a layer of bread cubes in each ramekin and top with 1 tablespoon of apple mixture. Add remaining bread cubes and fill to the top of each ramekin. Pour 1/4 cup egg mixture over top of bread cubes in each ramekin and top with an additional tablespoon of apple mixture. Bake in preheated oven for 20 minutes or until bread is toasted and brown. Serve immediately. Apple season is one of our favorites ones! Here are some more apple goodies!